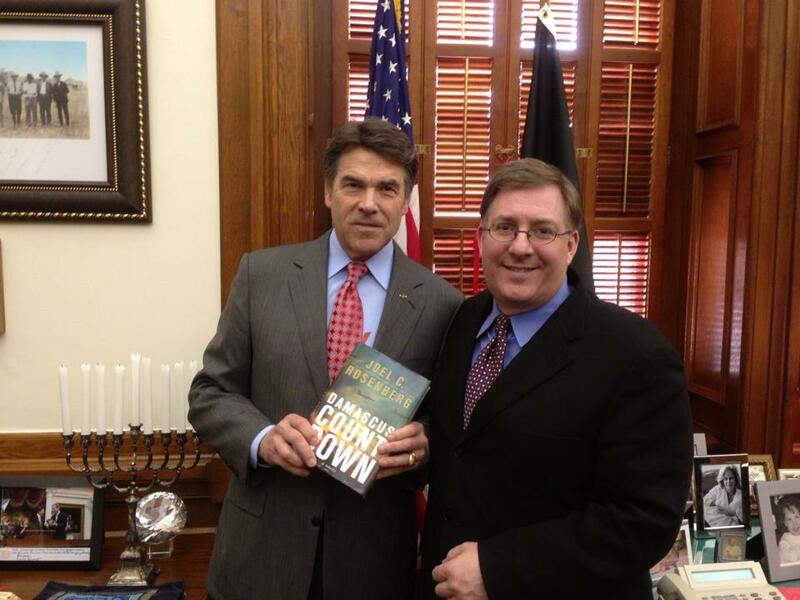 Meeting with Texas Governor Perry to discuss Israel & Iran. Meeting with Gov. Perry in Austin. On Friday, Texas Congressman Louie Gohmert and I met with Governor Rick Perry at the State Capitol in Austin. I first met the Governor at the Family Leadership Summit in Des Moines, Iowa last summer. There we had maybe 15 minutes or so talking about the economic and spiritual troubles facing our country. This was a much more substantive discussion. We had about 90 minutes together to discuss the President’s trip to Israel, the Iran nuclear threat, the possibility of an Israeli first strike on Iran’s nuclear sites, and the importance of maintaining a strong alliance with the Jewish state. It was an honor to present the Governor with a signed copy of Damascus Countdown. Our specific conversations were off the record, but I can say I learned a lot more about Texas state history — and especially Sam Houston — than I knew going in. I’m grateful for the Governor’s time, and for his strong support of the State of Israel and of doing all we can to strengthen Jewish-Christian relations.